I have a new-to-me Tassimo coffee brewer (Thanks Patience) that has been in the family for a few years. It's the first time I've had one of these single serve coffee machines. Each of our three daughters has a Keurig. I really didn't get what all the fuss was about. But when we travel south, it gave us something to look for to buy for the girls. We always try to bring back some of the K-cups flavors for them that are not in Canada. But now that I have my Tassimo, I am really enjoying it, every day and I do understand what the fuss is about. It's usually about mid-morning when I get the urge for a cup of something.... So for the last month, rather than slip out to Tim Horton's for a medium with milk, I just make my own. When I first got the Tassimo, I discovered my daily coffee mugs weren't big enough. So I bought a few big mugs. Then I read on the side of the Tassimo package, that in order to get the full decadent experience, the lattes should be brewed in a heatproof CLEAR mug. So, in my birthday package from the triplets and family last weekend, I got a pair of clear heatproof mugs. Today was the first day that I'm around to have my usual latte. I was so excited to finally see what my lattes have been looking like all along. And you know, I do think that the visual experience does make the latte even better. Don't you think the drink is pretty? I will be using these mugs every day. Thanks Guys!! ﻿We had a nice visit with our daughter and family at the cottage this week. They decided to take a paddle down to see the beaver dam at the end of the bay. It was a beautiful paddle. Emily paddles while Dad relaxes. Emily still kayaks with her dad, but from the looks of it, Dad had a pretty easy ride, and Emily did all the work. It won't be long and she'll be taking her own kayak. Thanks for the great visit guys. 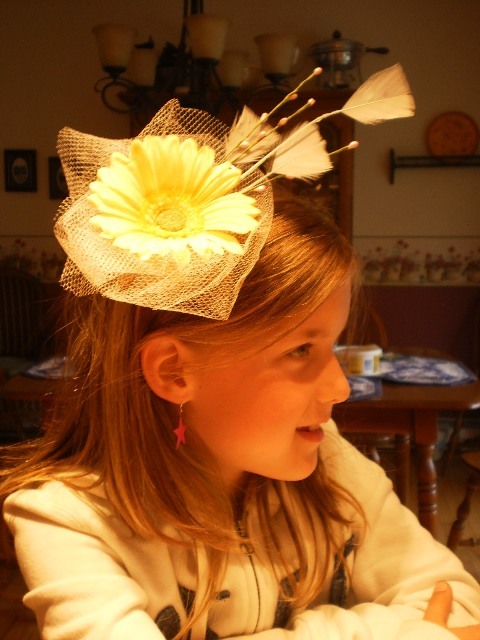 Caitlin with the simple yellow flower facinator. Next weekend, we are all going to PEI to have a short visit with the newly wed royal couple, Princess Cate and Prince William. We're all going and we are doing a few things to prepare. We've got the schedule of the Royal appearances, and planning our best viewing strategy. We're digging out our best sundresses and coordinating flip-flops. Since Princess Kathryn has really brought these cute facintor headpieces into fashion, we're going to wear some fun facinators for the Royal walk-about. So, with a bunch of supplies from Fabricville and Michaels, and a hot glue gun, I have finished 10 facinators. 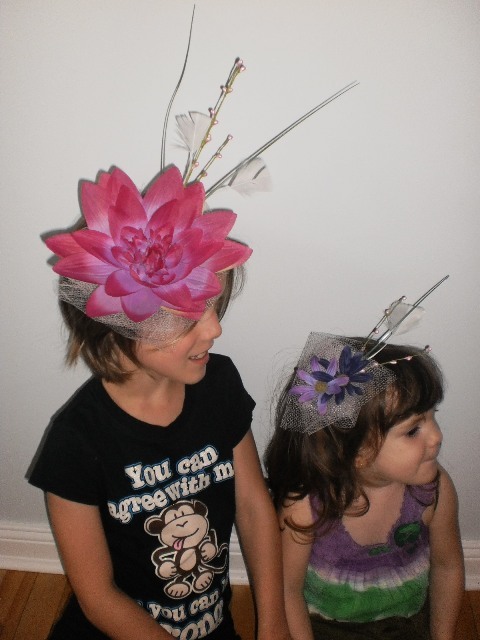 Here are some of the head pieces. Mama P wears a more flamboyant piece. A hairdresser can pull this off easily. Grace and Aurora love modeling their facintors. So will you get a chance to see the Royal Honeymooners on their trip to North America this week? I love my birthday. It was a fun day and it was nice to have visits from the kiddos. Caitlin stayed last night and we put in some quality Grammie time. We knitted on her practice piece. And we sewed a bit. We looked at old photos of her and her brother and sister when they were babies. 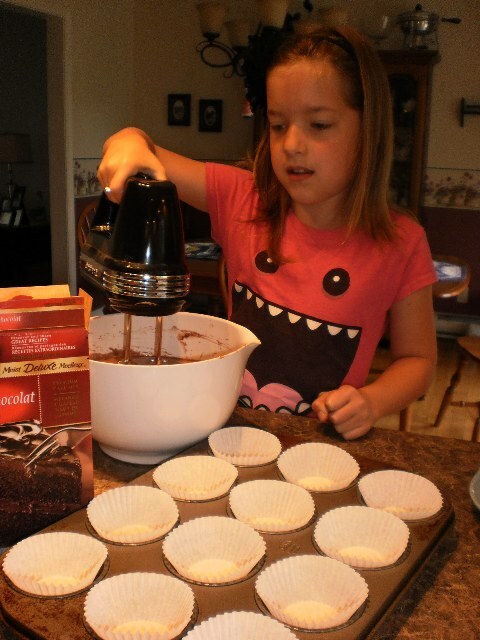 But most importantly she was in charge of making cupcakes for my birthday. She did the whole thing herself. Because it was my birthday, she chose the style of cupcakes and sent Grampie out to get the groceries that she needed. She did all the cooking and did the dishes too. So far so good. Chocolate cupcake batter. 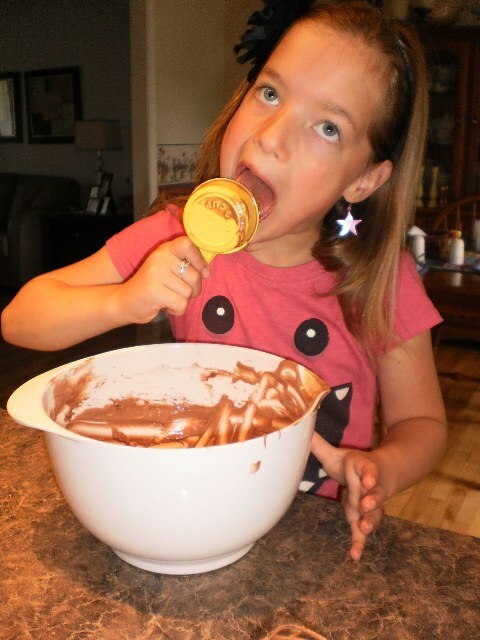 The cupcakes are baking, so who can resist licking the bowl. 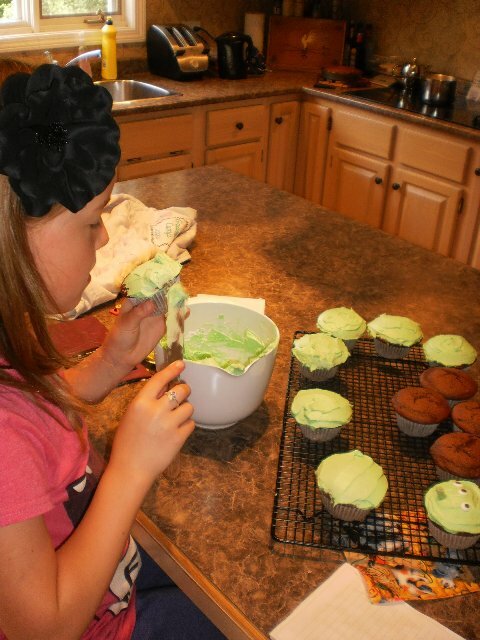 Caitlin is a whiz at icing the cupcakes. And Voila! 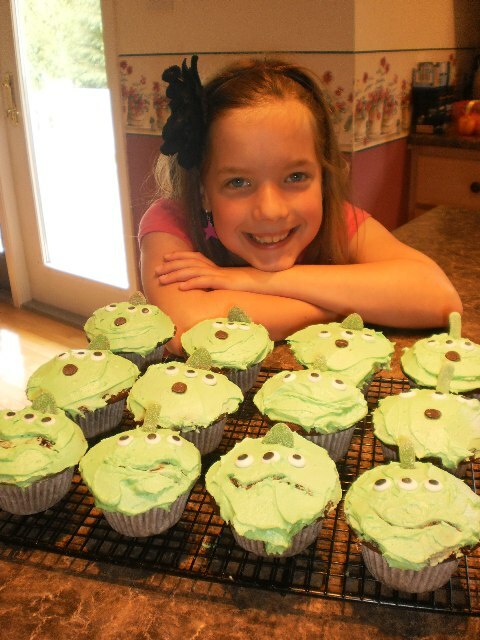 Toy Story Alien Cupcakes. Later in the afternoon, the rest of the family guests came for a BBQ supper and we all enjoyed these great cupcakes for dessert. We saved some for Jessica and Emily when we see them at the cottage tomorrow! I had a great day on my birthday! I found this new kitchen tool last week at Winners. It's called the Pancake Pen. You mix up your pancake batter in the bottle, and then draw out your pancakes on the griddle. The tip is a silicone tip and won't melt if you accidentally touch the griddle with it. You need to supervise young kids closely if they are making their own pancakes. Emily and Jessica are a little older now and are very careful around hot appliances. Here Emily is demonstrating how to use the pancake pen. She made a sun with lots of rays coming out. And Jessica drew her and Aurora's initial. Notice that the J is backwards so that when it's flipped over, it's the right way. 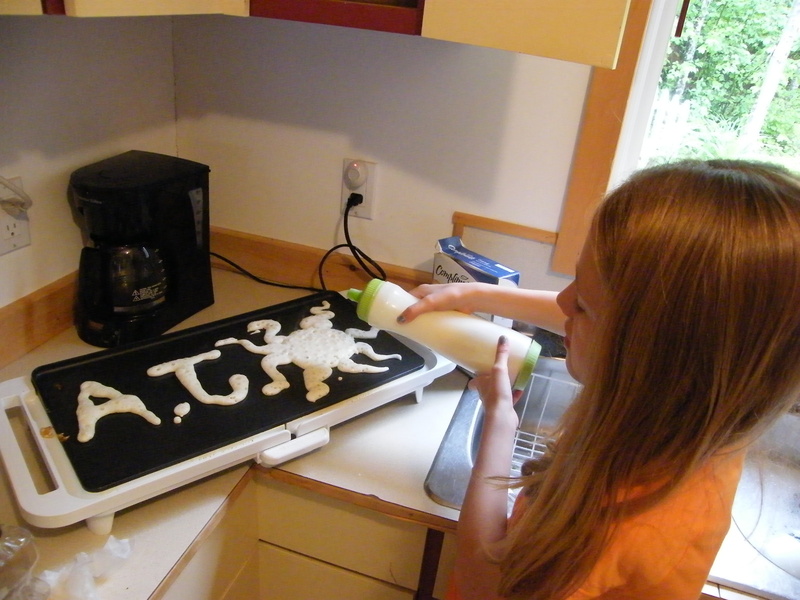 Yep, we like the Pancake Pen and it will stay in our cottage kitchen.. 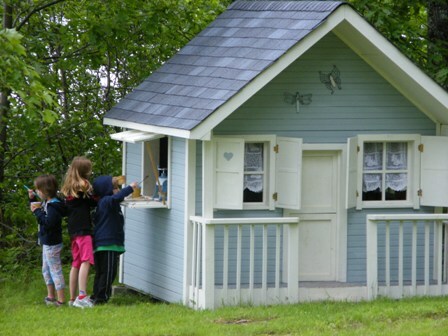 While the weather was not great this past Father's Day weekend, that didn't stop the kids from having some outdoor fun at the cottage. 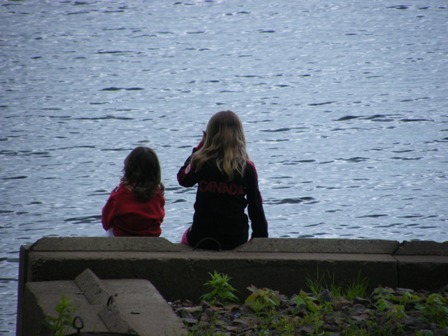 Emily and Aurora enjoying a little rest to watch the water. 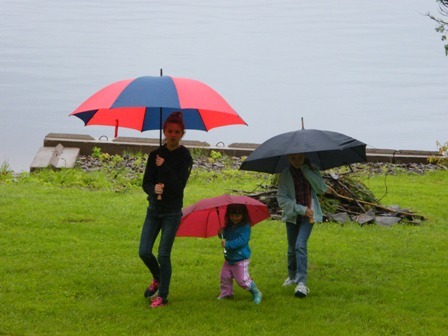 We're not going to let a little rain stop us from having a little outdoor time. Rain stopped... so the take-out window is now serving blue raspberry snowcones! 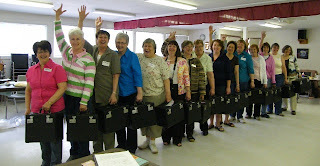 On Thursday I picked up my DMC perle cotton from the stitching shoppe in Moncton. And then it was on to sorting out my blue fabrics for the blocks. The pattern calls for 6 darks, 6 white/lights and 3 mediums. That's a lot of fabric, but the good news is, is that I had over half of them in my stash. This morning, I drug a bag full of fabrics down to Country Crafts quilt shop and laid them all out. With Diane's help, we eliminated a bunch right away. Then after pulling about 18 bolts out from her shelves and auditioning them, we found the 6 fabrics that were needed to complete the range. Now, I'm ready to piece and stitch. Is it July 1st yet!!!! A few weeks ago, I cut a kit to make two quilts for a set of twin boys who will be born in July sometime. This week, I spent a few hours getting into these two quilts. I'm using the Itty Bitty Baby Boy Quilt pattern from Piece and Quilts. The free pattern can be found on the Moda Bakeshop here. I've adjusted the pattern so it's a bit smaller. I plan to have these quilts done by mid July, just about the time they are born. So I now have the 60 brown blocks with the blue criss crosses in them, and the 40 white blocks with the criss crosses on them. Later this week, I'll be laying out the alternating criss cross blocks to form the argyle pattern and put in the plain white blocks, then sew them together. Happy Birthday to my great hubby today. Caitlin was by earlier this week perfecting her balloon hat making skills. She learned and tested all the various balloon locking techniques. She quickly caught on to the techniques. And ta da.... 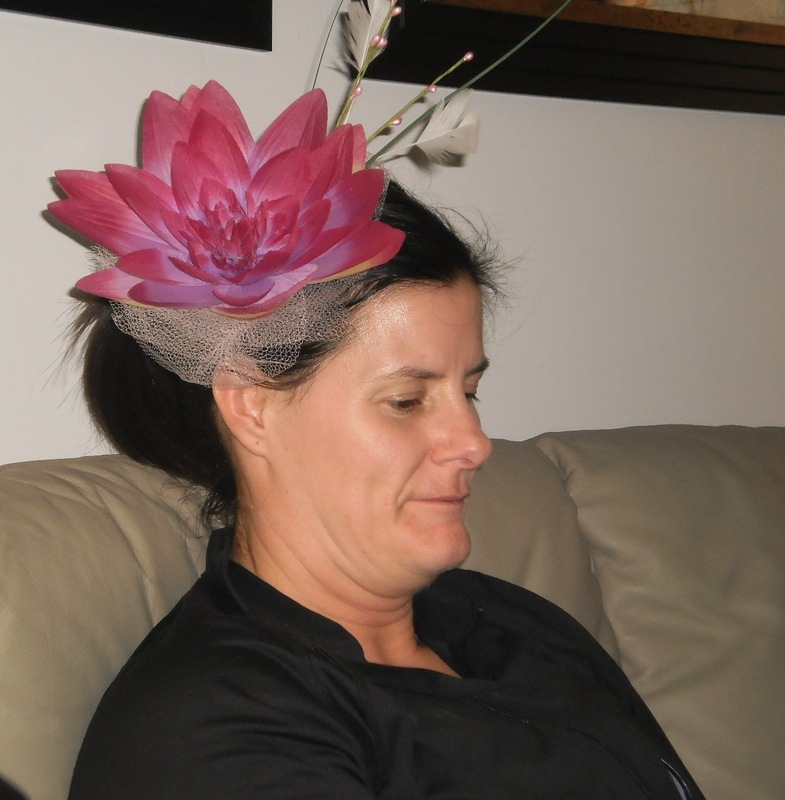 Here is Caitlin presenting her hat creation. This is grampie's " I love my unicorn hat face". 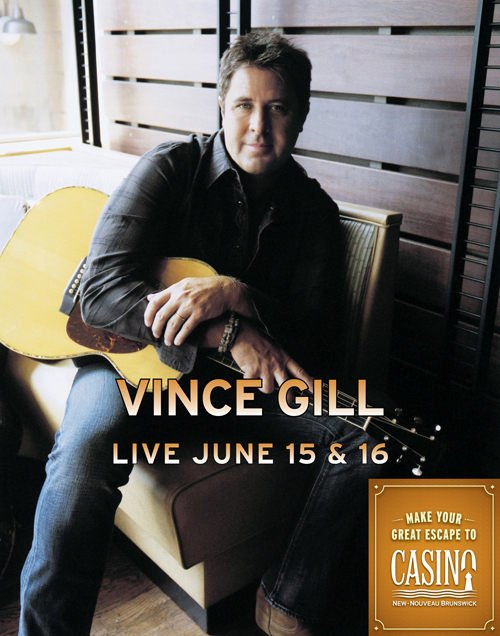 Do you like twangy country music? My hubby loves that type of music. And since Vince Gill is coming to our neck of the woods, well Moncton that is, we plan to go to the concert this evening. It should be fun because there are a bunch of other couples going as well. I love it when I order online and I get my things quickly. Just last Monday, I placed an order for some Featherweight things from Featherweight 221. In particular, the little shoes or feet on the bottom of my featherweight were flat, and somewhat sticky. I guess if I stood in my shoes for 60 years, they would need changing too. Anyway they desperately needed replacement. So, this whole order started out because I need the 4 little feet. And well, why not get a thread spring to keep the spool of thread from wobbling too bad. And of course, every picture I see of a featherweight has the red felt thread pad for under the spool of thread. Got to have one of those. The Singer lube is hard to find, so I really needed one of those because next May, my machine will need a drop of lube. And then I may as well have this great thread guide for stitching quarter inch seams or what ever size seam I need to do. OK, my light bulb works great, but just in case it burns out from all my stitching, I now have a replacement bulb..... And since I feel like I belong to a very unique group who own featherweight sewing machines, I ordered the lapel pin. I'll wear it on my fabric nametag when I go to guild meetings. And my FW friend Karen G. showed me her great book that shows how to operate all the antique attachments, like the ruffler. I now have this book too. It has fabulous close up pictures and great instructions on using the attachments. So after all this, I know my sister will remind me of the well read kids book she bought me a couple of years ago "If you give a mouse a cookie". 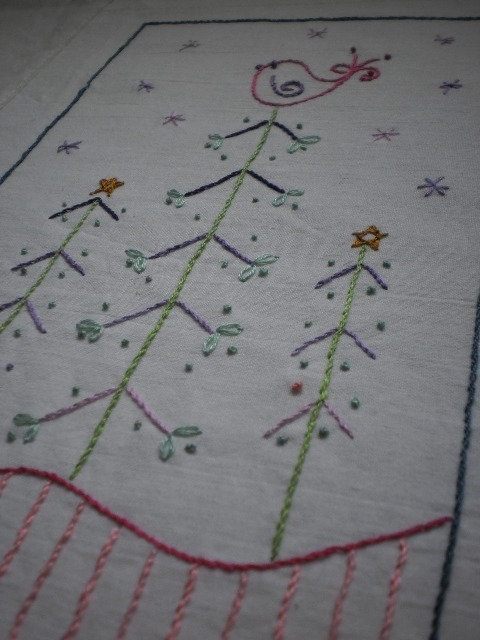 In preparation for my Christmas in July project, I completed my little warm up project at the cottage this weekend. It's just sweet. Even though it's not done in Christmas colors, it will still bring a smile to your face. 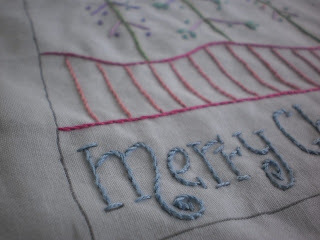 This little project was a free download, from Gail Pan Designs and this little Merry Christmas stitch project can be downloaded from this link.. I happened to be in Michael's on Friday and picked up this $6.99 spring hoop. It works fabulous for me. Just lay your fabric over the blue hoop, then squeeze the hoop down into the other side of the fabric. I didn't have to stretch the fabric to get the right tautness... It was perfect for me. After I finished my little Christmas birdie project, I had borrowed some various threads to test out. I'm not convinced that 2 strands of DMC are now what I want to use. Here is a picture of my little test. I also have the Finca 12 wt, but it seems to be exactly the same as the Sulky 12 wt thread. I think I'm settling on a 12 wt twist, but not sure what brand I will use. It will depend on what I can buy locally now. On Thursday, I'll be making my first visit to a stitching store in Moncton called "Because you Count". I'm looking forward to my visit there I'm sure they'll have something that will be just fine. So there, with a couple of weeks to spare, I think Ill be ready to start stitching on July 1st. That will be Canada Day, and we'll no doubt be at the cottage. I will post about my Christmas in July progress on each of the 5 Sunday's in July starting on July 2nd. Now I have to figure out how to do a blogpost from the cottage without the internet. We've been having our share of great weather lately, and I love that all my sister's efforts in bring me plants for my gardens at the cottage, are paying off. It's been a effort in experimentation as to what will grow in our flower beds at the cottage. It seems to change from year to year. Last year, the pole beans wouldn't grow, even after a second planting. This year, they're all up, and seem to be saying, "Hey, where's the string?" Luckily, the climbing strings are now up and I expect to see a few shoots aiming for the string next weekend. Pole beads with newly planted morning glories in the front. I'm moving along with the prep work for my Christmas in July Winter Wonderland project. I have 9 of the 10 blocks traced, layered, and basted. I still have not picked out blue fabric for the blocks. This week I haven't been doing much piecing. We've been painting the deck, and if you've ever seen our wrap around deck, you'll understand it's a multi-day job. And I've come down with a sinus problem that's not making me feel like sewing. But this week I did do a small hand embroidered sampler to test the DMC floss and my stitching over the Frixion pen markings. It's all looking good. You can see that it's hard to see the pen marks under my stitching. Not that it matters because I plan to give it some heat to make the marks disappear. You can see that I haven't finished the outside line yet on this little test piece , but I'll do that soon. My friend Karen G. is stitching the same project. She found a thread chat form on connecting threads website. They were discussing various threads people used to stitch this very project. I'm going to get a piece of embroidery thread to try on my sample to see if I like it better than the DMC floss. The worry about the floss is that one of the threads might shred while stitching. When I did my sample, I did have a bit of that, but I discovered that I was cutting my thread too long. Once I started using shorter threads, I was OK. In another email conversation with somebody who completed their Winter Wonderland last year, we confirmed that the second layer of fabric is to hide the floats so they won't show through. She mentioned something about stitching clean. As I was stitching my project this week, I was trying to stitch clean, but I think for me, it's near impossible. I'm glad now to have the second layer of fabric to stitch through. In doing my sample, I learned a couple of things. I need a good hoop, preferably one that is spring loaded. 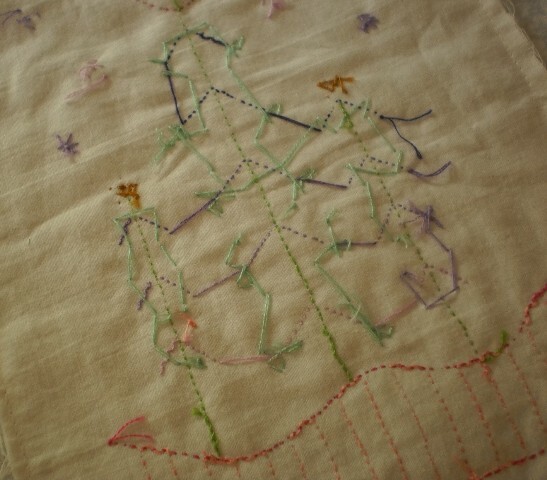 The other thing I learned is that this very small piece, which is about 7" x 10" took me about 4 or 5 hours to stitch. I'm thinking that my much larger Christmas in July project is probably going to be a Christmas in July, August and September project. I had some very important visitors after school today. Yep, it's the triplets. They're almost done school for the year. It was a great sunny day, so we had an ice cream and spent some time on the back deck. We were doing a bit of project planning. Do you play Angry Birds? I do. But not very well. I'm struggling with level 11. If you know the game, you know, that's not very good. Hopefully, I'm better at making Angry Birds with the kids, than playing Angry Birds. I'm making a list and then off to Fabricville to get some felt and other supplies in the Angry Bird colors. Then the kids will come by individually for a project day with Grammie. 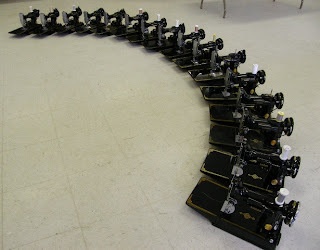 ﻿Remember, last winter, I told you of my new featherweight sewing machine. I was so excited to get it, but then I had this fear of something going wrong. What would I do if I broke it? How do I oil it? All this kept me from starting to sew on it. I talked to a few other featherweight owners, and I discovered I wasn't the only one. So a Featherweight workday was organized and 15 of us dug our featherweights out of the closet, and came out to learn how to maintain and use our machines. Oil, Lube, threading etc. We intended to go through all the feet, but we didn't have enough time. But I see that as GREAT excuse to all get back together again and sew with our new found confidence. Gail with all the Featherweights. My new featherweight buddies carrying their featherweight cases. Featherweights - From the oldest to the youngest in the front. I think my basting approach is going to work just fine. It's hard to not use an iron in this process, but with careful planning and a bit of starch on the under layer, it's all good. I have 5 blocks marked and basted. Layer the marked block over the backing block of the same size. Smooth with your hands to make sure all the sides are even. No ironing! Add a few spritzes of 505 between the layers. I use the center part of a Coke bottle to ontain the spray. Smooth with your hands so there are no wrinkles. Your fabric should handle like a single piece of fabric now. Pin if you are insecure (like me). Lightly mark about a half an inch outside the permiter lines indicated by the pattern.. I marked an additional line half way through the block for added stability. Stitch by machine using a 5 or 6 stitch length. You will have some gathering puckers... Smooth the puckers with your fingers from the center to the sides. Repeat for each individual line of basting. Do not use continuous sewing...or it's hard to smooth the puckers. Voila. It's basted and ready for hooping and hand stitching. I couldn't wait! I picked up my "Winter Wonderland" pattern from Country Crafts. I read it over and over and I began developing an approach that I would take to do this project. I couldn't get it out of my mind. I decided I would mark a couple of the blocks. A commenter left a message last week that she recommends to do the larger blocks first. I can totally understand why. Do the big stuff while the excitement and energy is high.. Right? So that's what I'm doing. 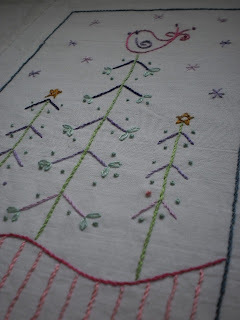 Tracing over the pattern to fabric is a perfect application to use my FriXion pens. I taped the 40" long paper to my patio door window. Then carefully centered my plain white cotton over it and taped it to the window, over the paper pattern. I slowly and carefully went over all the lines. It's a gel pen, so even though the pen is not upright, the ink flowed without a problem. I use this pen almost every day for something, and now I'm curious to see how long the pen will last. One little snag that I didn't anticipate was that the pattern calls for a second layer of cotton to be placed under the marked fabric then iron both layers together. So the hand stitching is through two layers. Then baste them together so that the re-hooping doesn't shift the two layers. Of course with the FriXion marks I cannot iron them, or the 1 hour of marking is lost. I will use an alternative method.. lightly spray base the two layers together then baste by machine. If I plan to get this done in the month of July, I have a lot of prep work to do so that I have any hope of achieving this. I intend to have all the blocks marked, layered, and basted, ready to stitch. I also plan to cut some of the blocks later this month. I need to find the right blues first. I am anxious to start stitching on July 1st. Aurora was here for a visit over the weekend. She was thrilled with the hooded swim towel that I made her a week or so ago. She loved the puppy face and the floppy ears. She sings little songs all the time. She learns them at day-care. Here's a cute one that I had never heard before. She taught it to us all. Well at least Grace, Grampie and me. The words are below. It sure is a beautiful day, Aurora. What a sweetie!